Niska apartment in Wola with WiFi & balcony. Property 2: Niska apartment in Wola with WiFi & balcony. Miodowa apartment in Stare Miasto with WiFi. Property 9: Miodowa apartment in Stare Miasto with WiFi. 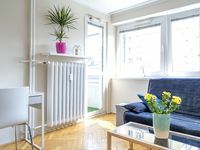 Freta 2 apartment in Nowe Miasto with WiFi. Property 31: Freta 2 apartment in Nowe Miasto with WiFi. Rynek Starego Miasta 1 apartment in Nowe Miasto with WiFi. Property 47: Rynek Starego Miasta 1 apartment in Nowe Miasto with WiFi. Very cozy apartment and fully equipped kitchen! Clean, close to Center of the City and transport. Owner will work with you, getting ready if possible, before check in time.